As our little boys and girls proceed towards school in the early morning with a heavy bag on their back, it invokes in my mind the pilgrims of John Bunyan’s novel “The Pilgrim’s Progress.” When the pilgrims of Bunyan carry the load of sin in their bag, our children carry the load of books. The pilgrims’journey is from the City of Destruction (this world) to the Celestial City (the heaven), our children’s journey is from home to the school. Both, pilgrims and children have to face similar pangs while on their journey. The questions come why are they carrying this “smothering weight”and is there no relief? The teachers pushed them in the coaching centres, and the authorities need admission test, Primary Education Completion Exam, PECE; or Junior School Certificate, JSC exam. Reading is no more delight for them. It’s the other name of a boring compulsion. A number of factors are responsible for this situation and loaded schoolbag has a lion share in it. Many students go to school merely to meet their friends and play with them. It is our greatest failure to make learning a matter of pleasure. The failure of government primary schools results in the development of Kindergarten and English medium schools; they usually have more books. Some guardians consider it as matter of prestige to read in English medium school. Teachers’ greed for guidebook publishers’ commission is another cause of loaded schoolbag. NCTB has an English Grammar for class nine and ten, but teachers have no interest in it for the same reason. After school, children move to coaching centres or teachers home that also force them to carry more books and notebooks. Students also carry lunchboxes and water bottles in their bags. Researchers have found that 6 to 12 year is very critical period for spinal development, and load of books may cause great damage to spine, shoulder, knees and back. Let's now discuss the matter of remedies. First of all, parents/guardians need awareness of the whole situation and consequences. The ruling of the High Court (December 2016) that kids cannot be forced to carry schoolbag weigh more than 10% of their body weight have to be implemented immediately. Monitoring cell of education ministry has to be formed and punitive measures must be taken against the violators, for it’s a violation of human rights also. Our honourable prime minister also has shown great concern over the matter, and urges to reduce the number of books but we don't see any result of it.The schools or guardians that have capability may have two sets of books –- one at home and another in the desk of their classroom. And they can also use tab or laptop with e-textbook like the developed countries. The number of textbooks should not exceed the number of classes, and it may be subjected to teachers’ checking. Some slothful students rarely remove books from their bag. Many schools can afford pure drinking water and they can prohibit carrying water bottle. Schools may have a temporary mobile hygienic first food shop under teacher's supervision from where children can buy food of their own choice. 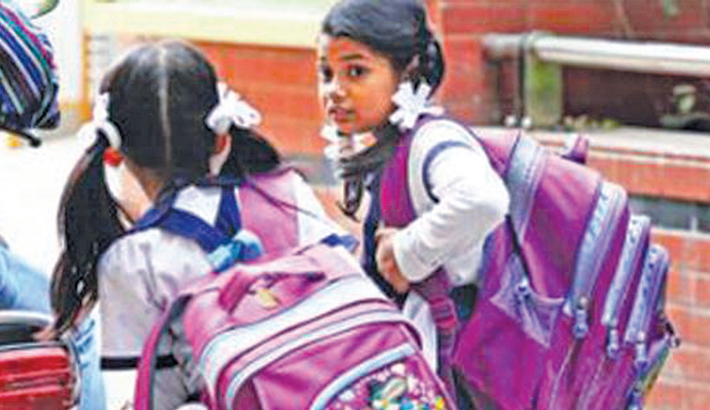 The authorities dealing with curriculum may evaluate the rationality of increasing the number of textbooks from 6 to 13 as children get promoted to class six from class five.NCTB can monitor if schools are prescribing other than their books. There is no alternative of capping the weight of schoolbag from class one to ten. Education is the backbone of a nation while the weight of schoolbag is damaging their spine and mind. For this heavy load of books children's heart weep, but their parents or authorities cannot hear it.Their smiles evaporates as their parents are stealing their childhood. If William Blake would be living, he might have said: “I’ve seen them locked up in coffins of ‘schoolbag.’”(Chimney Sweeper of Songs of Innocence). Would our new education minister appear as a blessed Angel to open “the coffins and set them all free” so that they can rejoice in the open field? The author is associate professor of English currently working at Dhaka College.